If you've followed this blog for some time, you'd probably read about the deal I made with Toyer Mamoojee in 2016. By continuously supporting and encouraging each other we did indeed achieve our stretch goal and returned to Agile Testing Days as speakers. A new pact for 2018? Yes, a new pact with Toyer and even further people from a growing pact group. But what? Well, the core question here is: What's my next challenge? What scares me most nowadays? This time it was not as obvious for me as last year. So I started brainstorming, trying not to overthink it and to listen to my gut feeling. These were roughly the thoughts passing through my mind. Well, blogging (and especially pressing the publish button) is something that still scares me - but it got way easier throughout the last year. What do people say? If it scares you, do it more often? Well, that was really working for me in this case. Public speaking!! Still scares me, but that's the deal of last year... Well, and here as well I could reduce my fears a lot. Making all those baby steps really helped to lower the scariness level, by exploring outside my comfort zone but not too far from it. And honestly it felt great overachieving my initial goal in the end. Still, I can't pick that one again. Pairing with experts. The deep talk with Maaret about personal and community development at Agile Testing Days this year triggered so many thoughts. And she invited me to pair with her! I'm frightened but I have to try this, it will be an awesome learning experience even if I totally fail. Oh and she came up with the idea to initiate an online mastermind exploratory testing peer conference. And wants me to kick it off together with her! Still speechless. Ah I know another one: getting feedback! Don't know why this is still so scary; just thinking of it is. I made a lot of great experiences this year getting feedback, and even before. Mostly only good came out of it! And it was always a chance to learn from it. However, it still scares me a lot. Making my skills transparent and myself vulnerable is already quite scary, and then getting feedback on it? Oh my. But it's not only about getting feedback. Giving feedback is just as scary! Especially on a personal level. Why is this still so hard for me? Why do I catch myself using so many words for such simple things. I'm not making things any better by that, for anybody. Maybe I should just not give feedback on a personal level...? Liz Keogh shared great food for thought on that topic in her keynote at Agile Testing Days. Or should I just practice giving feedback even more to make it less scary? That makes me think of the Women and Allies gathering at the conference. My deeply personal scary topic here was how to react well on bad talk, or bad situations. I can be such a coward sometimes!! I really hate this. I don't want this to be the future me. Talking about this with my colleague made me even remember that I had more courage already before! But get me burned once slightly, and I take this as easy excuse ever since. Arrgh. What else? Writing a book. Yep. I still remember what some of my colleagues told me after I shared the great news that I had been accepted as first-time speaker: "Great! And next year you're writing a book." Oh my. Sounds simple, right? I know it's definitely not. I finally have the feeling I can provide some value by sharing my thoughts in blogs and even talks... but I definitely don't feel experienced enough to write a book. Come on, think bold. Organize a conference! What Viv did on his very own with SwanseaCon! What Patrick and Kristīne did with bringing TestBash to Germany! What Maaret, Franzi and Llewellyn do with the European Testing Conference! They invest so much time and effort. I can't even imagine how much. Another topic: Reaching out to the community for help. One of the best things I ever did! But I still do it rarely and it costs quite some guts. Despite the good experience I had with it. Really, I cannot understand myself sometimes. Hm, last year I got inspired by Abby Fichtner. Who or what inspired me the most at Agile Testing Days this year? Maaret with mob testing, learning by osmosis and our deep conversations? Angie with owning our narrative? Janet with using those pivotal moments in life? That we're indeed a strong community and it's worth to give and get back? This brings me to another point. We talked about personal development and our midterm goals at a meetup of my company's testing community. 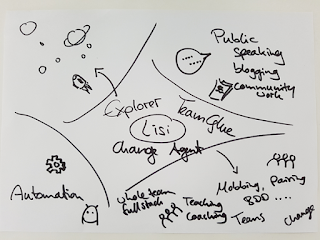 I even hosted that session myself and asked everyone to create any drawing or mind map or notes representing them. My drawing showed that I invested a lot of effort on blogging, public speaking and sharing with the external community this year. And I focused a lot on pairing, mobbing, close collaboration in my product team. But what about those other core areas of exploration and automation I'd like to improve? I hate to admit it, but I fear failure, and I fear "losing my face". Showing my weaknesses. I am aware of many of them; probably unaware of many others. I hate the idea that I could potentially show how few things I know, or how few things I am able to do. Did I mention that I hate getting feedback? Even if I am well aware that it's the most valuable thing another person can do for me? To add an afterthought: We do exploratory testing sessions with tester candidates in our interviews. Following the approach Elisabeth Hendrickson describes in her book "Explore It!". Considering my fear of making my weaknesses obvious - I probably would completely fail our interview... Still, I happily put others through that experience. As everybody learns from it, right? Does that seem right to you? Reflecting on my own thinking, I realized there's sort of a pattern here. Many things that scare me the most nowadays can be combined in a challenge which will lead to general growth as a person, as well as professional growth as a tester. Last year Toyer's and my objectives had been the same: "return to Agile Testing Days as speakers". This year, our next goals diverge - but we still encourage, support, and hold each other accountable. That's the core part of the pact: stretch yourself - get support - achieve more than you thought you would on your own. As this time my part of the pact is not as simple and easily comprehensible as last year, I felt the need to formulate the problem in a more elaborate way. For a long time I was the only tester in my companies, without having a mentor or more experienced person to learn from. Now I am finally not alone anymore as I have fellow testers at my company and found the external testing community for myself. However, I still have problems to see where I actually stand and how I can improve my testing skills. I read and think a lot; but I don't practice enough. There are so many testing areas to deep dive into, but I feel I need to fix my basics first: exploratory testing as well as automation. My personal challenge here: I already experienced how much value close collaboration and concrete feedback can bring, how safe this can be, and how great this environment is to learn. However, it still scares me to test together with other testers as I fear their feedback when making my weaknesses transparent. I believe that pairing and mobbing with fellow testers from the community on hands-on exploratory testing and automation will result in continuously increasing skills and knowledge as well as serendipitous learning. I’ll know I have succeeded when I noted down at least one concrete new insight or applied one new technique per testing session and shared that with the community. I do at least ten pair or mob testing sessions until end of October 2018, meaning one per month in average until next Agile Testing Days. Each pair or mob testing session lasts at least 90min. I pair or mob test with at least 6 different testers. The fellow testers come from both my company's internal and the external community. The topics focus on either exploration or automation. They can cover special topics like security, performance, accessibility, etc. but don't have to. I publish my lessons learned on my blog, one post per testing session. I make my personal challenge transparent in my company in form of an objective with key results and track my progress there to provide an example for my colleagues. When writing up all those thoughts it struck me. To come to above reasoning and my chosen challenge, I had several influences and especially influencers. First of all, this year my product team first gave the mobbing approach a try - with huge success! We continue find more value in it. We even added it to our team's interview procedure nowadays. Then Lisa Crispin shared her tips when pairing with developers which inspired me earlier this year to discipline myself and find more time to do so within my team. I even thought of cross-team pair testing already to help each other improve their skills. Just lately I had again a great pairing experience. Today a developer asked me over to pair test with her before she puts the ticket to review. First thing she said: "I know you would want to see the code diffs" so we went through them, found a minor issue, instantly fixed it. Tested further and found high quality work. Awesome! Additionally, I got heavily inspired by a set of awesome blog posts by Sal Freudenberg running the experiment of a coding tour and writing about her experiences afterwards; so far about pairing, mobbing, and again pairing with a different developer. Big coding tour take away so far: Sure, the technical learning curve is hard, but the vulnerability and humility is harder. Then Agile Testing Days came, with the mob testing tutorial - finally finding myself practicing together with other testers, not only developers. This was scary already, but we all had a very good experience and learned a bunch together. And then there's Maaret herself of course. My mind keeps wandering back to our conversations. It was wonderful to exchange thoughts, share fears, get feedback, getting offered to pair test and to initiate an online peer conference together. There were so many key moments for me at Agile Testing Days this year, so many growing opportunities. But now I realized that for me personally, this was the very core key moment regarding my personal development: getting the offer to pair test with a very experienced tester; and accepting. Granted, I've elaborated quite a bit on my part of the new pact. A bit too much to remember the new challenge easily. So here's the short version: "return to Agile Testing Days as testing traveler". As a traveler I'll be learning step by step as I go, picking up things on my way. I'll be learning from the people I join on the topics we'll touch. I'll be receiving but also giving back, trying to trigger situations of serendipitous and accidental learning. All in all, this is a big push towards scariness for me. But I'm already looking forward to what I may find on this journey. So, off to new frontiers! The testing tour is about to start. Yay, a hypothesis and an experiment! I should do that too. I would be happy to pair or mob with you in 2018! Really? That would be absolutely awesome!! I'll come back to that :D Thank you Lisa for your feedback. In case you do think of an experiment for next year yourself, I'd love to learn about your experiences! Brilliant as usual, so much food for thought there. Love the introspection and digging out those hidden gems when one pushes themselves.